Friends Forever™ is dedicated to present you this trendy and fashionable piece of collar design. 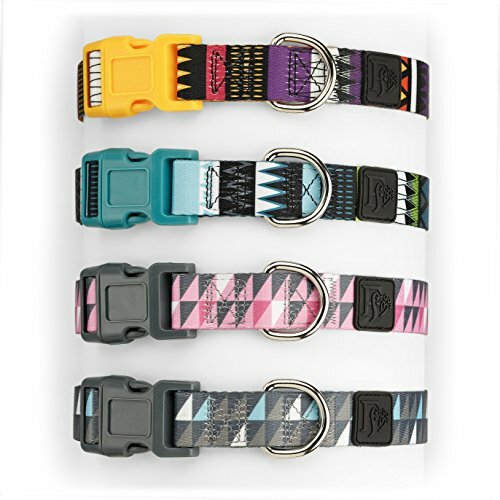 You can easily imagine your dog wearing a collar that is in the perfect tribal pattern and vibrant colors. This exotic tribal print would definitely attract attentions from other dog owners; praises and compliments come afterwards. Designed in a total eye-catching palette of extravagant green and fusion pink. Our designer aims to create a look for instant chic. If you like our product, please share your experience with other customers. We welcome the feedback! If you are not 100% satisfied in our service or product quality, please contact us for rectification. We would love the chance to make things right for you! Our mission is to be the unparalleled leader in creating pet products that meet the highest level of quality, innovation, and function. To offer superior customer service that results in a premium shopping experience. The dog collars in the first picture are sold separately The durable layer is added to match the tribal print polyester webbing. The metal D ring is chrome coated to add durability. The loop tied to the logo is specifically designed for the purpose of attaching dog charms, tags, pendants or accessories. Please do not attach any dog leash with this loop. The collar is not made for the purpose of tie out. Please measure your pets carefully to make a safe and fit purchase. Always look at the size chart for the recommended weight range to confirm the size.